I read a lot of news, and I share a lot of the news I read on Facebook, Twitter, Google+, and LinkedIn. Since I also work with helping clients with their online marketing, I suppose that perhaps I’m more prone to see where the publications I read can improve. One such opportunity came to my attention the other day as I was reading an article in the South China Morning Post entitled Chinese internet firms jump on IPO bandwagon. I thought the article was interesting, so I went to share it on Twitter by clicking on the Twitter button as marked below. When I clicked on this button I got a Twitter popup allowing me to share the article. This is what it looked like. What’s wrong here? After all, I want to share a link to the article, right? The problem is I don’t just want to share the article. I also want to share the title of the article, otherwise all my followers on Twitter are going to see is a link. I’m not giving them any reason to read what I’m sharing if they don’t know what it’s about. “Oh, Josh is sharing a link to something? I should check that out.” Sure, some people might think that way, but most are going to pass by the opportunity to click on a link unless they have some idea of what it’s about. In addition, when I share an article I like to inform the author by including his Twitter handle. Finally, I like shortened URLs, using a service like Bitly. What I really want to come up is something more like this. In order to tweet this, I would have to copy and paste the title of the article from the page, go to Bitly.com and shorten the link, then paste it, and then figure out the Twitter handles of the author Ray Chan and SCMP. Am I going to do all that? Or am I just going to say “Aw, forget it,” and not share the article at all? More likely the latter. It’s hard to say exactly how much extra traffic SCMP is missing out on by not having Twitter set up this way. 24 hours after the article was published the share number for Twitter stands at just one. Maybe this is the reason why. By the way, that’s not Ray Chan’s real Twitter handle. As near as I can tell, he doesn’t have one. Any publication targeting an English speaking audience should make sure it’s writers all have active Twitter accounts and are interacting with readers on them. It’s not hard to fix this. Twitter shares detailed instructions on how to modify the Twitter share button to pass variables in to exactly determine what shows up when someone clicks it. For the Bitly shortening bit, check here. 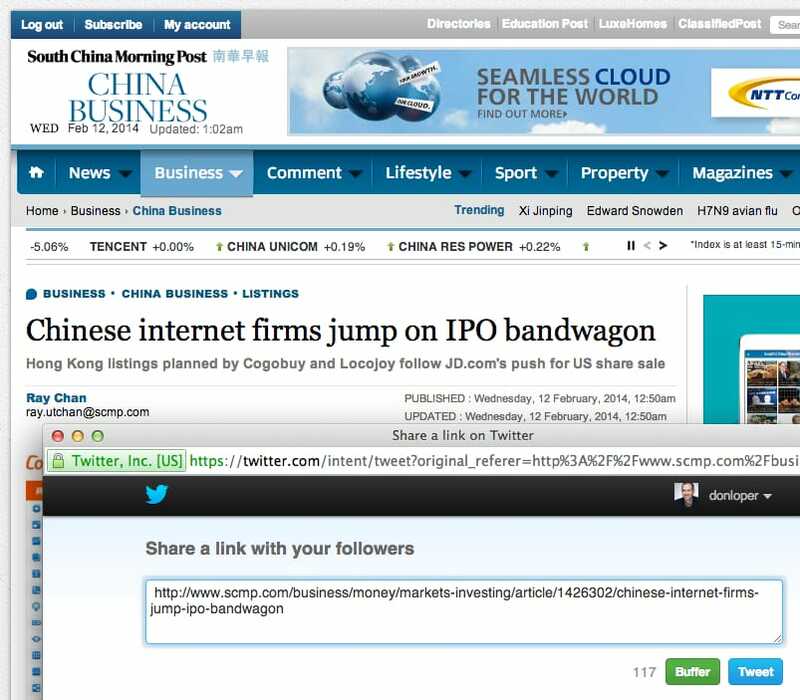 With a few minutes of work, SCMP might be able to get a 10x, 20x, or 100x increase in Twitter sharing. But as they say, knowing is half the battle.